Tired of programming your kick drums and basslines in separate instruments? A rich, flexible, keenly-priced source of hybrid kicks and synthesised basslines that sounds great and inspires creativity. Perfectly tuned for interesting, powerful kick/bass combinations. As every dance and electronic producer knows, getting the kick drum and bass working well together is one of the most important considerations in the making of any track. Native Instruments’ TRK-01 aims to make building that perfect rhythm section easier than ever by bringing kick and bass together in a single sequencing synth- and sample-based instrument. It’s a Reaktor Ensemble that requires either the full Reaktor 6 or the free Reaktor 6 Player (VST/AU/AAX/Standalone) to run, but once fired up, it operates and feels just like any other plugin or application. In a nutshell, TRK-01 comprises dedicated Bass and Kick engines, in which various synthesis methods - and/or samples for the Kick engine - are used to generate the two sounds in question, embellished with modulation and effects. Importantly, it’s entirely self-triggering, with dual step sequencers playing back in sync with the host DAW when used as a plugin, or its own clock standalone, and MIDI note input used only to switch between sounds and sequences. There’s a lot going on within TRK-01’s many tabs and sub-pages, but it’s all clearly laid out and fairly easy to navigate. Synthesis and effects controls occupy the big central area (Kick on the left, Bass on the right), the sequencers and Master effects sit below that, and the Tuning and Timing parameters are up top. Up to eight bass and eight kick sounds can be held in a preset (Snapshot), switched between via MIDI or using the mouse, so you can flirt with subtle variations on a single sound, or jump around between completely different ones within a track. The Kick engine enables mixing of two sound Layers to create a composite kick. Each Layer can house one of three synthesisers or the Sample player. You can import your own samples into this, or take advantage of the 80 included electronic and acoustic kicks, and 40 supplementary snares, hats, claps, percussion and FX. While the latter are presumably intended for top-end sizzle, it is possible to sequence, say, kick and snare samples by modulating the Layer mix control. The three synths comprise an analogue model that morphs between sine, triangle and square waves, with a filtered pulse wave mixed in for ‘buzz’; the sine/noise-mixing Rumble mode, for interesting low-end movement; and Noise mode for mid- and top-end presence. All three synths share a common pitch envelope. With no regular MIDI note input, TRK- 01’s Kick and Bass engines can only be triggered by its two step sequencers. Thankfully, though, these are intuitive and effective, offering eight keyswitching up-to-16-step patterns apiece, with each pattern cycling automatically through up to four separately programmed pages. Steps are activated by clicking them, and dragging upwards in a step sets its velocity. The Pitch lane in the Bass sequencer offsets the pitch for each step by up to five octaves up or down, while activating steps in the Hold lane extends note lengths. The base key/root note is set in the top bar, where preset and custom scales can also be defined for the Bass engine to snap to, and Swing and Groove timing modifiers are applied to both sequencers. As well as triggering the two engines, the sequencers can also modulate their parameters. Click a step’s Lock button to enter Step Lock mode, then move as many knobs as you like in the target engine to have them instantly jump to those specified positions every time playback reaches that step. Alternatively, double-click the name field under any knob to enter Parameter Focus mode, in which all the Step Locks for that knob alone are edited across the whole sequence. At the top of the section are eight controls governing a LP/HP/BP filter with overdrive for each Layer, Global tuning and the aforementioned Layer mix (with adjustable crossfade and gain curves). All of these can be freely modulated using two flexible AD envelopes and an impressive LFO that blends a morphable waveform (sine-triangle-square again) with optional noise. Clicking the button in between the Kick and Bass engines opens the Effects page, which is home to a three-band EQ, a compressor, and sends to the Master Delay and Reverb (see below) for each, plus switchable Insert modules. In the case of the Kick, this can hold one of three distortion types, or a low- or high-pass filter. The Bass engine features five synthesis types: a saw/square-morphing, dual analogue-style oscillator with adjustable pulse width; a seven- stacked super saw; a Buchla-style wavefolding oscillator; a two-op FM oscillator; and a wavetable oscillator. Each of these is tweaked using two contextual knobs and the Modifier processor, which offers pitch-tracking Ring modulation, Frequency shifting, wavefolding or sample rate reduction. A filter (low-pass or notch, with feedback) provides frequency shaping, and a sub oscillator is on hand for reinforcement. Two ADS envelopes and an LFO modulate the eight Oscillator, Modifier and Filter parameters, as does the ingenious Ducking Envelope. 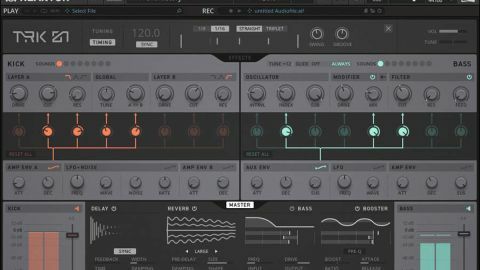 This syncable ‘rising’ envelope is triggered by the Kick engine, enabling not just the volume of the Bass synth, but any of its other parameters, too, to be ducked for sidechain-esque kick drum clarity and sound design. It’s highly editable and one of TRK-01’s best features, synergising the Kick and Bass engines beautifully. The Bass Insert effects selection, meanwhile, consists of Distortion, Unison, Flanger and Phaser. Finally, the Master section contains Delay and Reverb send effects, plus a low-frequency saturator/enhancer and a compressor for bus processing and kick/bass ‘gluing’. And predictably, like all of TRK-01’s effects, these all sound superb. There’s a rawness and energy to TRK-01’s sound that we really like. The ability to bring in your own samples is very welcome, of course, and although the synth engines aren’t massively deep, they deliver more tonal variety than you might expect. It doesn’t feel hemmed in by its own keenly focused remit. However, while the sequencing side of things is very well done, making it easy to program wildly animated kick parts and basslines and keyswitch between patterns, the lack of a regular MIDI input option for live play and piano roll sequencing is needlessly restrictive. All it would take is a single note assigned to Kick and, say, an octave of notes to Bass, even if it meant using automation instead of Step Locks. Other than that and a yearning for a second bass layer, we have no complaints. With its focused architecture and effects, comprehensive sequencing and modulation, the brilliant Ducking Envelope, and stellar sonics, TRK-01 really could be all you need for cohesive kick/synth-bass combos with real character and low-end impact.